Communities Secretary Eric Pickles has lost a court battle over his decision to scrap the last government's regional housing targets in England. The move was ruled unlawful by the High Court. 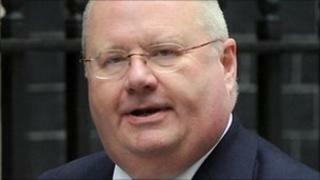 Housing developers had asked the court to block it, arguing Mr Pickles had abused his powers. Mr Pickles had said he wanted to return planning powers to local communities. An aide said that no appeal was planned. The ruling means that controversial plans for building thousands of new homes in each English region could be back on - but a government source said the court ruling was only a "technicality" and would not change anything. That is because legislation will be published next month that will deal with the issue, he suggested. Housing developer Cala Homes (South) Ltd argued that Mr Pickles was wrongly seeking to revoke regional planning strategies through discretionary powers. Mr Justice Sales, sitting in London, ruled that the Cala Homes argument was "well founded". The developer argued primary legislation should have been introduced, giving MPs the opportunity to debate an issue crucial to future planning in England. It claimed Mr Pickles's decision "struck at the heart of parliamentary democracy". The government argued that regional strategies were made by regional assemblies, an undemocratic tier of regional government, and this undermined directly elected local authorities. Ian Ginbey from Cala Homes' lawyers, Macfarlanes, said the legal challenge to Mr Pickles's decision "wasn't an attack on localism at all". But he said scrapping the targets without anything to replace them had "left a policy vacuum, caused confusion throughout the industry and directly resulted in proposals for tens of thousands of new homes being abandoned". He conceded that the High Court ruling might only succeed in delaying the scrapping of the targets until next autumn, when planned new legislation is likely to come into effect. But he said it could mean that many housing developments rejected on appeal since the targets were scrapped in July could now be back on the cards. "What today's judgement identifies is that he (Mr Pickles) wasn't entitled to make the decision in the way that he did," Mr Ginbey told BBC News. David Orr, chief executive of the National Housing Federation, which represents housing associations, said the decision to get rid of the targets was "a hasty and damaging move, which has already seen plans for over 180,000 homes scrapped". Shadow communities secretary Caroline Flint said the court ruling "raises embarrassing questions about the way Eric Pickles ripped up plans for desperately needed new homes". She added: "The coalition's housing policies are doing little to meet the aspirations of the hundreds of thousands of families who want to live in a decent home." The court's decision was welcomed by the Home Builders' Federation which said it would help local authorities plan new housing developments using the old targets while a new "locally-based" planning system is put in place over the next two years. But junior communities minister Bob Neill said it "changes very little". "Later this month we will be introducing the Localism Bill to Parliament, which will sweep away the controversial regional strategies. "Top-down targets don't build homes - they've led to the lowest peacetime house-building rates since 1924. "The government remains firmly resolved to scrap this layer of confusing red tape. "Instead, we will work with local communities to build more homes. This was a commitment made in the Coalition Agreement and in the general election manifestos of both coalition parties. We intend to deliver on it." The court heard Mr Pickles decided in July to revoke the regional strategies, which include house-building targets, introduced under the 2009 Local Democracy, Economic Development and Construction Act. James Eadie QC, who represented the Communities Secretary, argued in court that Mr Pickles had power to revoke the entire regional strategy tier of planning policy guidance and was entitled to do so as it was not operating in the public interest. Mr Pickles has been at the forefront of the government's efforts to decentralise power - and has fought a series of high-profile battles with quango and council bosses over alleged extravagance with public money.